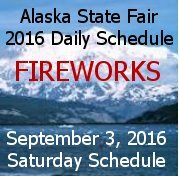 Gates open at 10:00 am. 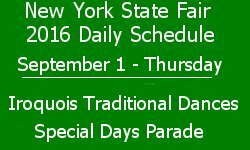 / Carnival open at 1:00 pm. 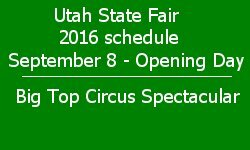 Riders perform back flips and handstands while flying in the air between two ramps, 75 feet apart. 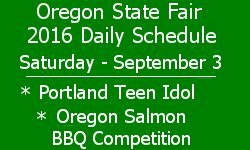 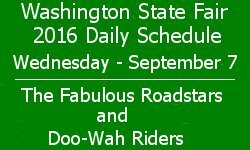 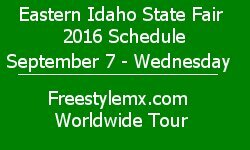 Oregon State Fair 2016 Daily schedule, September 3, Saturday has Portland Teen Idol, Motorsports Championship, Go Kart Racing, Square Dancers, X-Treme Air Dogs, Oregon Salmon BBQ Competition, Food Network Celebrity Judge, Texas Longhorn Beef Cattle Show and much more. 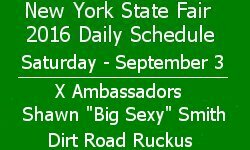 New York State Fair 2016 Daily schedule for September 3 Saturday has X Ambassadors, Sea Lion Splash, Dirt Road Ruckus, Rachel Platten concert, SCUBA, African Dance Troupe, Iroquois Traditional Dances, Swifty Swine Racing Pigs, World of Horses, Birds of Prey and much more.